Analysis: Can the grudging respect that's defined the relationship between the two survive the dawn of divided government? WASHINGTON — Shortly after the dust had cleared from the 2016 presidential election, House Minority Leader Nancy Pelosi, D-Calif., found herself on the phone with President-elect Donald Trump. Pelosi, the wealthy daughter of a Baltimore mayor and a three-decade veteran of Congress, and Trump, the wealthy son of a New York real-estate mogul and a newcomer to electoral politics, had crossed paths at various events over the years. But they were far from close. So Pelosi made the most of their brief conversation, taking special note of Trump's success in the Rust Belt states that provided his margin of victory in the Electoral College. It was a nod to his success in an area set to be an obvious battleground for the two parties in both the 2018 midterms and the 2020 presidential election — and a savvy play to his pride. Two years later, it was Trump's turn to offer phoned congratulations — and, hours later, to publicly praise both Pelosi's election night messaging and her political skills. "I really think, and I really respected what Nancy said last night about bipartisanship and getting together and uniting," he said at his White House press conference the Wednesday after Election Day. "A lot of people thought I was being sarcastic or I was kidding" with his post-results take that she should be speaker, he added — but "I wasn’t. I think she deserves it." As they get ready to meet at the White House this Tuesday for the first time in a year, the relationship between the Republican president and the Democratic congresswoman likely to lead the House next term figures to be the most consequential in Washington over the course of the next two years. It's a pairing that has so far been remarkable for the public respect they have shown each other in a political era defined by vicious personal attacks — particularly those delivered by the president himself. 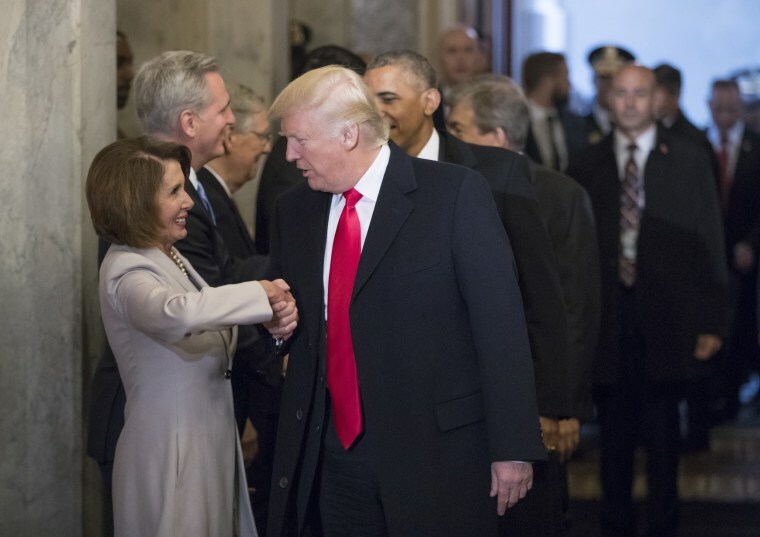 While Pelosi respects Trump's office, his interest in making deals and his performance in swing areas in 2016, Trump has high esteem for Pelosi's ability to count votes in Congress, deliver on her promises and refrain from attacking him on a personal level. "He has always maintained that the Democrats do a much better job of keeping their folks in line," said former White House communications director Sean Spicer, who once toiled on Capitol Hill himself. "He understands she's the person to make a deal with." While Trump has made a dark art form of the nickname-centric personal attack on political rivals — "Low IQ" for Rep. Maxine Waters, D-Calif., "Pocahontas" for Sen. Elizabeth Warren, D-Mass., and "Crooked Hillary" for Hillary Clinton — he's never devised a tag for Pelosi. He's attacked her policy views, and he went after her for saying he shouldn't call any undocumented immigrants, including gang members, "animals," but he has shied away from saying the kinds of things that could permanently sour a personal relationship. Part of that may stem from Trump's view of himself as a counter-puncher — someone who hits back hard only when attacked — and Pelosi's unwavering refusal to make politics about personality. That's not about Trump; it's just her way. "With members or anybody, she always sees it as you may be on different sides of the issue today but you may need that person tomorrow," said a person close to Pelosi. "So there’s never any reason to burn a bridge." And Pelosi's been here before. When she was first elected speaker in 2007, Republican George W. Bush was the president. By then, she had forged a warm personal relationship with him, even though she made her mark by leading her troops against much of his agenda in both the minority and the majority. But when Bush needed votes for the financial bailout in the latter months of 2008, Pelosi furiously whipped Democratic lawmakers to give their support. Despite the obvious political peril, she repeatedly delivered a majority of her caucus while most Republicans voted against legislation pushed by a weakened president of their own party. Whatever his reasons, Trump has been a cheerleader for Pelosi as she has pushed to put together the coalition she needs to become speaker in January. "I can get Nancy Pelosi as many votes as she wants in order for her to be Speaker of the House," he tweeted in November. "She deserves this victory, she has earned it — but there are those in her party who are trying to take it away. She will win!" Spicer said that's not about personal affinity. It's business. "I don’t think he’s particularly fond of her," he said. "He’s always about a deal. It's not a question about what he personally thinks. It’s about transaction." Pelosi, who has served in Congress since the Reagan administration, has often spoken about her esteem for the office of the presidency, regardless of which party controls the White House. It was in those terms that Pelosi formulated a rebuke to Trump this summer after he sided with Russian President Vladimir Putin over U.S. intelligence agencies on the question of whether Russia interfered in the 2016 election. "I come here with great sorrow, but with the utmost respect for the people who voted for President Trump, but President Trump’s actions have degraded the dignity of the office of the president, diminished the respect for our great nation throughout the world, and disregarded the obligation we have to our founders," she said. Her clear call for him to do better was carefully worded: It was about Trump's behavior, not him, and it included an explicit nod to her respect for his supporters. In the midterm elections a few months later, Democrats cleaned up in the Rust Belt states that had delivered Trump's victory. They won governor and Senate races in Michigan, Wisconsin and Pennsylvania — the states that provided his margin of victory — and netted four House seats in Pennsylvania and Michigan combined. Now that voters have given Democrats control of one lever of the Washington's legislative machine — and as both parties renew their focus on political battlegrounds — it is Trump and Pelosi who will together determine which issues get resolved and which are left for the campaign trail over the next two years. Each has an incentive to work with the other: It's hard to run on a record of accomplishment if they can't legislate together. Trump will want to bolster his re-election narrative, while Pelosi's House Democrats need something to run on. But there are counter-pressures, too. Any victory Trump can claim makes it that much harder for the eventual Democratic presidential nominee to run against him, and the respective political bases of Trump and Pelosi will be naturally reluctant to support any deals they cut with each other. That latter dynamic presented itself last year when Pelosi and Senate Minority Leader Chuck Schumer, D-N.Y. — who will join Pelosi at the White House meeting this week — thought they had struck a deal with Trump on immigration. But it fell apart as quickly as it came together, with the Democrats blaming Trump's harder-line White House aides for nixing it. Now, as they discuss the issue again with a government funding deal on the line, Pelosi herself is making her own bottom line clear: The Trump border wall at the center of the dispute, she told reporters last week, is "immoral, ineffective and expensive." Still, Pelosi does see a president she may be able to negotiate with — though not necessarily one she can count on: Having been burned before, she can't be certain he won’t go back on an agreement under pressure from aides or other Republicans.